Abstract: We describe and experimentally demonstrate a new technique to suppress third-order intermodulation distortion (IMD) in a coherent phase-modulated RF optical link. The anisotropic electrooptic coefficient of lithium niobate is exploited to simultaneously modulate orthogonally polarized fields. These fields are then combined to eliminate the third-order distortion. 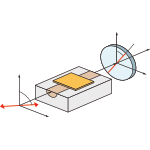 This technique uses a single phase modulator, requiring no external bias or control, for a highly linear photonic microwave relay. The resulting suboctave dynamic range is limited by fifth-order IMD instead of third-order IMD.